Looking for someone to code your app? Check out TheyMakeApps.com. 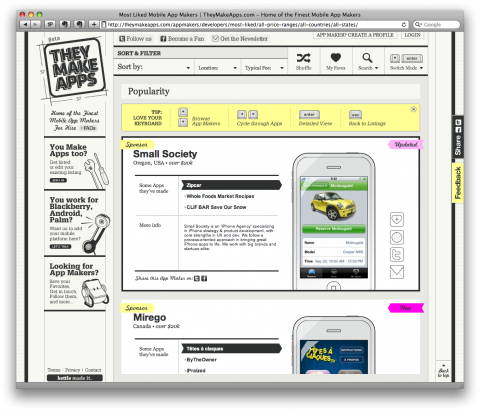 Look at it as the Yellow Pages for iPhone Developers. They make Apps? Wow, their website is so cool. Looks almost like my desk. Funny navigation work perfectly. Maybe I need one (App)! if we have just signed up but I actually would adore to see a specific letter (Lorelei Lee’s) is there some place i’m able to possibly look at it or obtain a copy somehow?